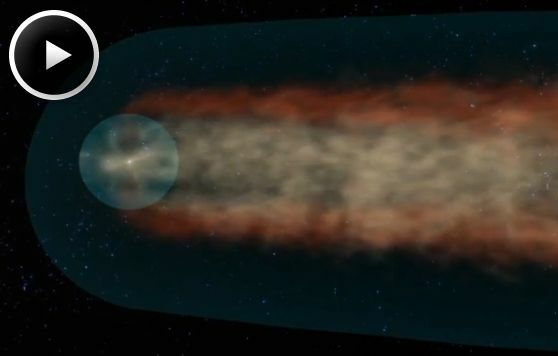 July 10, 2013: Like a comet, the solar system has a tail. NASA's Interstellar Boundary Explorer (IBEX) has for the first time mapped out the structure of this tail, which is shaped like a four-leaf clover. While telescopes have spotted such tails around other stars, it has been difficult to see whether our star produced one. The particles found in the tail -- and throughout the entire heliosphere, the region of space influenced by our sun -- do not shine, so they cannot be seen with conventional instruments. "By examining the neutral atoms, IBEX has made the first observations of the heliotail," said David McComas, IBEX principal investigator at Southwest Research Institute in San Antonio, Texas, and the paper's lead author. "Many models have suggested the heliotail might look like this or like that, but we have had no observations. We always drew pictures where the tail of the solar system just trailed off the page, since we couldn't even speculate about what it really looked like." "Since first light in 2008, the IBEX mission team has amazed us with its discoveries at the interstellar boundary, including a previously unknown ribbon of energetic neutral particles stretching across it," said Arik Posner, NASA's IBEX program scientist in Washington. "The new IBEX image of the heliotail fills in a previously blank area on the map. We are first-hand witnesses of rapid progress in heliophysics science." By combining observations from the first three years of IBEX imagery, the team showed a tail with a combination of fast and slow moving particles. There are two lobes of slower particles on the sides and faster particles above and below. This four-leaf clover shape can be attributed to the fact that the sun has been sending out fast solar wind near its poles and slower wind near its equator for the last few years. This is a common pattern in the most recent phase of the sun's 11-year activity cycle. IBEX is a NASA Heliophysics Small Explorer mission. The Southwest Research Institute leads IBEX with a team of national and international partners. NASA's Goddard Space Flight Center in Greenbelt, Md., manages the Explorers Program for NASA's Science Mission Directorate in Washington.